One person in twenty is Aware to the world of magic around them. Witches and alchemists ply their trade in backstreet markets and Pocket Kingdoms unseen by the mundane population. Elves and orcs run corporations, gnomes create fantastic devices in back room workshops, dwarves front heavy metal bands, goblins lead gangs for good and ill, and trolls find work as bodyguards and enforcers. A special few become Legends: epic heroes empowered to fight evil by the strength of their beliefs. 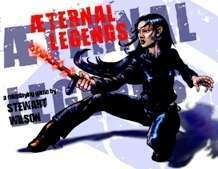 A Legend's quests can turn her into an avatar of magic, or pit her against Da'ath, the Dark Lord of the Abyss. Idealism is more than just a buzzword—it's the source of magical power. • 158 pages of modern-era fantasy RPG; a non-watermarked landscape-format PDF. • Powered by the Ready 2 Run system, which emphasises fast character creation and detailed action, with enough room to suit a wide range of campaigns. • Easy to use, a group needs nothing more than a handful of six-sided dice, pencils, and paper to play. • Broad in scope, every Legend has a path to enlightenment and glory. His Beliefs—in the form of game traits—give him power, whether he honours or betrays them. This title was added to our catalog on August 23, 2007.